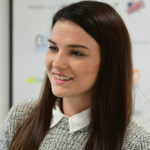 Georgie has taken the first step in her career and joined us three weeks ago to help the team with all things admin. Office Assistant. I help with the financial side as well as the day to day running of the office. Maldives, New York and Barbados – too difficult to choose one! If you had to be an animal what would it be? Stranger Things, I’ve been binging it all weekend! If you could swap places with anyone who would it be? If you were a crayon what colour would it be? Flying, I would never have to sit in traffic again or I could fly abroad to catch a quick tan.